1980s Yves Saint Laurent black velvet peasant skirt. Condition: Very good. Size 40/ current us 6 We accept returns for refund, please see our terms. We offer free ground shipping within the US. A lovely skirt with a nice weight and double stitched seams. 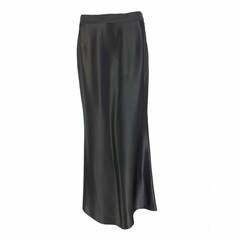 The skirt comes below the knee and has a high waist. A red velvet skirt by Yves Saint Laurent from his Russian collection. The skirt is in red velvet with black braid at the hem. It has a zip and pocket on the left hand side. A cosy cashmere skirt by Yves Saint Laurent Rive Gauche. The skirt is unlined, and has pleats on the front and back. The skirt has a zip opening on the left hand side.